Home > SWEETHEART OF A DEAL! Sweetheart of a Deal for you! 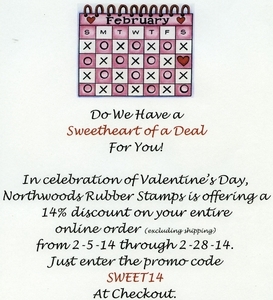 In celebration of Valentine's Day, Northwoods is offering a 14% discount on your entire online order (excluding shipping) from 2-5-2014 through 2-28-2014. JUST ENTER THE PROMO CODE "SWEET 14" AT CHECKOUT.